The King of Spain lashed out at Catalan authorities on Tuesday evening after hundreds of thousands of people took to the streets in Catalonia to vent their fury over the violent police crackdown on Sunday’s contested independence referendum. In a rare televised statement, King Felipe said the referendum’s organizers had jeopardized national stability. “With their decisions, they have systematically undermined the rules approved legally and legitimately, showing an unacceptable disloyalty towards the powers of the state — a state that represents Catalan interests,” he said. King Felipe’s hardline address was an unusual departure for the Spanish monarch, who used the majority of his speech to castigate Catalan leaders while making no reference to polling day violence that left nearly 900 people injured. He concluded the address with a call for national unity, while continuing to unleash a verbal assault on the Catalan authorities. “Today Spanish society is fractured and confronted. Those authorities have underestimated the fondness and feelings of solidarity that have united and will unite the whole of the Spanish population, and with their irresponsible attitude they have put the economic and social stability of Catalonia and Spain at risk,” he said. On Tuesday night Catalonia’s leader, Carles Puigdemont, told the BBC in an interview that his government would unilaterally declare independence by “the end of this week or the beginning of next.” If Puigdemont follows through on the promise in the interview, recorded before the king’s address, it would further deepen the constitutional crisis facing Spain. 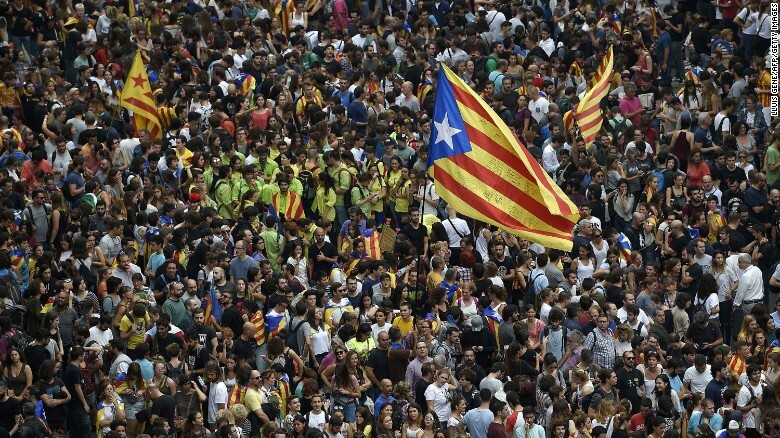 King Felipe’s decision to intervene in the crisis came after 700,000 people gathered in Barcelona, according to City Police, angered by the harsh treatment meted out by national forces who tried to prevent the banned vote from taking place. Many demonstrated in front of the Barcelona headquarters of the Spanish national police. Shops were closed, universities halted classes and transport companies ran reduced services as supporters of Catalonia’s bid for independence from Spain attempted to maintain the momentum from Sunday’s vote. Facing Spain’s biggest political crisis in decades,Spanish Prime Minister Mariano Rajoy held talks with opposition parties in Madrid. Spanish authorities have ordered members of the Guardia Civil, the national security force deployed to Catalonia to block the referendum, to remain on standby in the region for the next week. 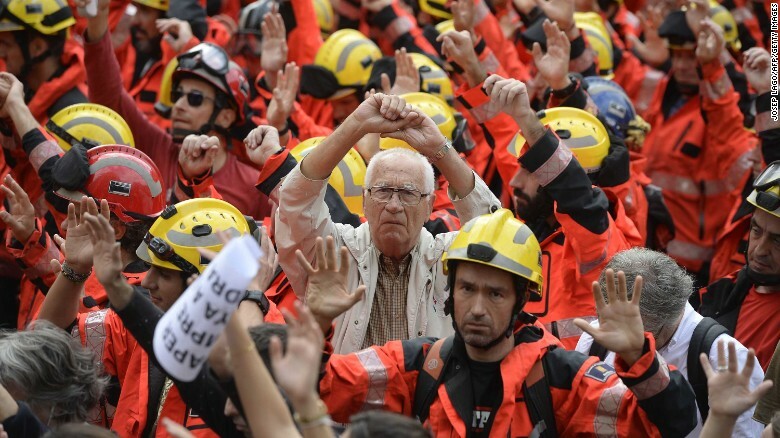 Protesters joined by firefighters raise their hands during the protest in Barcelona called by Catalan unions. 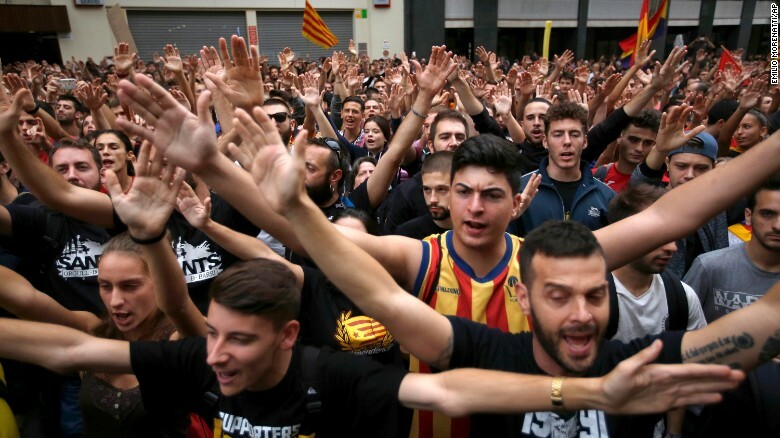 Protesters gathering in Barcelona said they were motivated by fury at Sunday’s violent crackdown — the Catalan health ministry said 893 people were injured as riot police raided polling stations, dragged away voters and fired rubber bullets. “This is a protest against police violence and maintaining momentum after Sunday,” said Victor Noguer, 27, a firefighter. “The streets will always be ours,” protesters chanted, some of them draped in the blue, yellow and red Estelada flag used by Catalan separatists. Protesters wave a Catalan pro-independence ‘Estelada’ flag as they gather at the Placa de la Universitat square in Barcelona during a general strike in Catalonia called by Catalan unions on October 3, 2017. Officers from the Guardia Civil and the Catalan police force stood guard outside the local headquarters of the Spanish government in Barcelona, where hundreds of firefighters gathered. 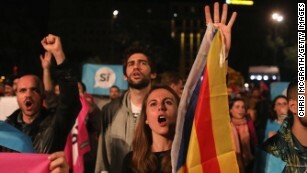 Protestors gather in front of the Spanish Partido Popular ruling party headquarters in Barcelona, Spain. The presence of the Spanish national police and the Guardia Civil in Catalonia is a source of increasing tension in the city following Sunday’s violence. Animosity is also rising between local and national forces. On Tuesday, the Guardia Civil police union, the AUGC, filed a complaint with the Catalan High Court against the Catalan police, or Mossos d’Esquadra, complaining that they failed in their duties by not enforcing the court ruling that banned the referendum. The AUGC also filed a complaint in connection with the eviction of 200 officers from the Hotel Vila in the Calella district of Barcelona. It called for a judicial inquiry into reports the mayor threatened to withdraw the hotel’s license if the Guardia Civil remained there. Spanish newspaper El Pais said two hotels in Barcelona and hotels in Reus, 100 kilometers from the city, have ordered Guardia Civil officers to leave following Sunday’s referendum. Spain’s Interior Minister, Juan Ignacio Zoido, said Madrid would “take all necessary measures” to stop the “intolerable harassment” of national security forces. The Catalan government says it earned the right to split from Spain, claiming 90% of those who voted in Sunday’s poll were in favour of independence. But the result was not decisive: turnout was low, at around 42%. Catalan authorities blamed the crackdown for the low turnout, but it remains clear that public opinion in Catalonia is deeply split on independence. Catalonia’s President Carles Puigdemont stopped short of declaring independence for Catalonia Monday. According to the referendum law passed by the Catalan Parliament — and declared illegal by Spain’s top court — authorities have 48 hours after the result to declare a split. 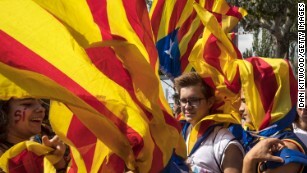 Catalan authorities have not yet presented a final result to the Parliament in Barcelona. Puigdemont has called for international mediation to resolve the crisis. On Monday, an unrepentant Prime Minister Rajoy met Spanish opposition leaders to discuss the government’s next moves. 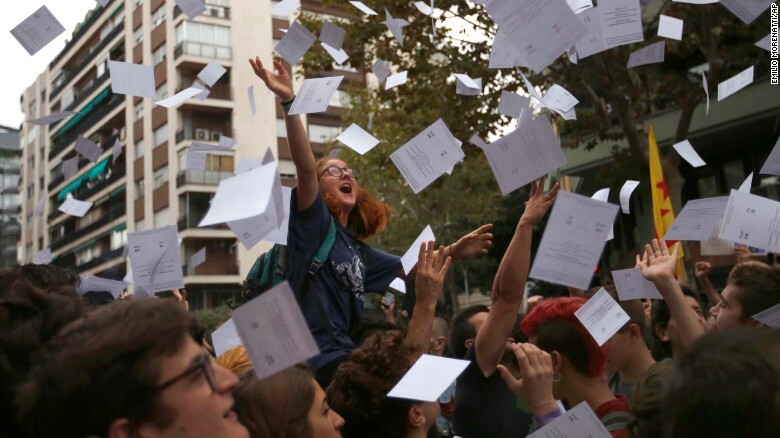 Protestors throw referendum ballots as they rally in front of Spain’s ruling Partido Popular headquarters in Barcelona. Rajoy’s office said Tuesday that he was considering calling a special session of Spain’s Congress of Deputies to discuss the crisis. So far, European Union leaders and the European Commission have backed the Spanish government’s opinion that the referendum was illegal. The European Parliament, the EU’s only elected body, will discuss the crists on Wednesday. The issue Catalan cause is likely to find more sympathizers, especially from the smaller nations. The UN Commissioner for Human Rights has asked to be allowed to send in experts to examine if citizens’ rights have been violated.